Spathylophyllum (Peace Lily), in 10 inch dia. pot. Added water after 3 weeks. Plant in good condition. Owns 16 houseplants. "Plantastic! fantastic for the bigger plants - ficus trees, etc. Good product." 5-31-2011 I have 4 of the original bottles purchased around 2003 and they are still working like new. Love this product and the new design isn't bad either! By the way their customer care ROCKS!!!! This plant owner used Plantastic! on a fern in an 8 inch dia. pot for 35 days. Plant in good condition. "We think it is a great idea!" Plantastic! watered fern and spider plants in a 14 inch dia. pot for 39 days. "Plants in fine condition." Fern in 8 inch dia. pot Watered for 18 days. "Excellent condition." Gardenia in 7 inch dia. pot. On Plantastic! 15 days. Condition "Very good . It grew about 2 inches." Only owns 2 houseplants but "convenience is very nice." Palm in 10 inch dia. pot. 26 days. "Excellent condition. Great idea!" Shamrock plant in 10 inch pot. 25 days on Plantastic! Good condition. Owns 7 plants. Split leafed elephant ear philodendron in 16 inch dia. pot. Very large plant. "Still perfect after 17 days. Started to droop after 27 days." Owns about 15 houseplants. Aglaonama (silver queen) in very large pot (>10 in. dia.) On Plantastic! for 26 days. A twin plant (not on Plantastic) required 8 cups of water during that period. Peace lily in 18 inch pot. 26 days on Plantastic! Plant healthy. Owns 5 houseplants. "Your Plantastic!® is great in helping save my plant's life." "Plantastic! - Fantastic!" Unknown plant in 8 inch dia. pot. 3 ½ weeks on Plantastic! "Excellent condition." Owns 19 houseplants. Rex begonia in 8 inch pot. 3 weeks. "plant very good." Owns 5 plants. " I'll certainly use is each time I go out of town." "Leafy plant" in 7 x 7 pottery. 17 days. "Excellent condition -some growth was new. 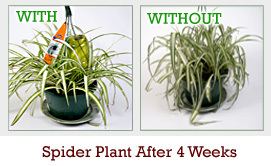 You might possibly use full time so as not to forget to water houseplants." Pothos philodendron in 10 inch dia. pot. 14 days (stopped early; had to leave on vacation). "Excellent condition." Owns 12 - 15 plants. Owned and operated 6 flower shops in Baltimore. Violet in 8 inch dia. pot. Condition very good after 17 days. "Very good idea." Unknown plant in 12 inch dia. pot. Plant "great" after 22 days. " A very good idea". Philodendron in 8 inch dia. pot. Plant in good condition after 25 days. Now has in very large ficus tree.